Based in Goshen,IN, KeystoneRV Company is one of the largest manufacturers of towable RVs in the world. The company’s lightweight fifth wheel camper is known as Cougar X-Lite. 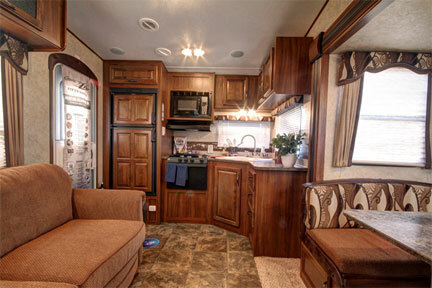 1. : The Cougar X-Lite fifth wheel comes with a rear kitchen. The camper has a single slide-out. The 25RKS variant of Cougar furnishing is elaborate with a fridge on the interior of the door, and a cooking range with three burners. The double kitchen sink with windows to look out at the scenery you pass through. There is also a microwave oven, and plenty of cabinetry and drawer space for all of your dishes and things. 2. A booth dinette slide is placed a little inside from the foldable bed-sofa. Overhead cabinetry to provide sufficient space for storing essentials. The inside space for lounging is adequate. The nearby entertainment center can easily be viewed from anywhere in the room. The pantry with many cabinets and storing space is placed just in front of the bed room and bath. 3. The master bedroom at the front comes with a lot of open area to move around. The bedroom is fitted with a queen bed and a nightstand. The spacious wardrobe offers you a lot of storing space for your dresses and shoes. 4. The bath is on the side, and it comes with a trendy shower, modern toilet and a sink. 1. The 25RKS model sleeps four. It has a length of 27 ft 2 inches and external width of 8 ft. The external height is 11 ft 11 inches. 2. Interior colors are vineyard, bronze and platinum. 3. The hitch weight is 1125 lbs, dry weight is 6376 lbs and cargo weight is 3549 lbs. 4. The model’s fresh water capacity is 43 gals, grey water capacity is 56 gals and black water capacity is 28 gals. 5. The tire size of the fifth wheel is ST225/75R15D and the furnace 30000 btu. 1. There is a queen bed in the front of the camper with a cabinet overhead, and flanked by night stand and a wardrobe. 2. The toilet features a commode, a hand wash basin and a neo-angle shower. 3. Adjacent to the toilet wall towards the central part of the camper are entertainment center and pantry. 4. The center of the camper features a hide-a-bed sofa and the dinette. 5. The rear of the floor plan shows a kitchen with sink, three-burner stove and refer. The floor plan gives a roomy picture of the interior. The model indulges the user with the modern décor and latest equipment. The pleated shades all around the camper add to the beauty and grace of the interior. The black tinted safety glasses in the windows enhance the look of the camper. Cable/satellite prep and the 32 or 40 inches TV ensure entertainment while camping. The kitchenette looks smart with Stainless steel microwave oven with turn style and the trendy refrigerator. The highly functional air conditioner takes care of the living comforts. There are many more fittings and furnishings to enhance creature comfort while camping outdoors. All in all they make Lightweight Keystone Fifth Wheel Camper one of the most desirable campers in the market. I know of two people now, one from Rhode Island, who had a 1991 pop up camper and one from South Carolina who had a 1985 truck camper and they both sold their campers for the 5th wheel campers. This was a big step up for them, but they had to adjust to the towing and the different style of turning and stopping as well as where they could fit in a campgrounds. One brought a 29 ft and the other brought a 32 foot 5th wheel. They were both made by Keystone, one was used, and one was new. To enter both, you would never know that one was older and used from the one that was new. Except for the difference in style and features, both where comfortable, roomy and had its own distinctive look. I think that is why Keystone fifth wheels stay in business. The campers where four years apart, but they both appear in the same condition, which means the older one was taken care of and the construction and design holds up after time. With Keystone fifth wheel campers, you have the comfort of a home away from home. I would even call it a home on wheels. Some of them that you see, people set them up in campgrounds and live for months before moving on when the weather changes. This is the life, if you ask me. You always upgrade the new models with different package deals, but the older ones may have been upgraded or you can upgrade them yourself in most cases. You will never know what you are missing if you do not check out everything before making the leap to a 5th wheel camper.